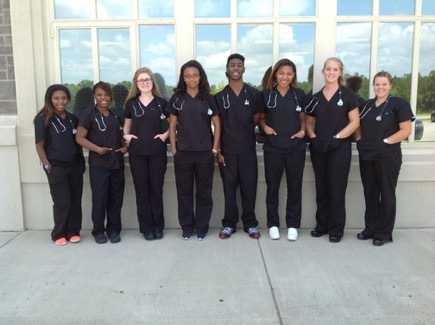 This past summer, Mid-Carolina AHEC partnered with Westwood High School to offer graduating Health Careers Academy seniors the opportunity to take a Certified Nursing Assistant course. The course was taught at Westwood High School by Amanda Ashley, RN. The course is regulated by the South Carolina Department of Health and Human Services and has very specific curriculum and guidelines. There were eight students who participated in the two-week course that included 60 hours of classroom instruction and 40 hours of clinical instruction. Prior to beginning the course, these students completed coursework that included reading and answering all review questions from the textbook. Students learned objectives including safety, infection control, legal and ethical principles in healthcare, elderly care and a variety of nursing assistant skills. Upon successful completion of the classroom curriculum, students received clinical experience at Rice Estate in Columbia. Rice Estate Director of Nursing Amanda Burgess facilitated the clinical portion of the class by allowing students access to the facility and residents. Students were able to practice the nursing assistant skills that they had learned in the classroom including feeding residents, taking vital signs, ambulating patients and much more. At the end of the course, students attended a mandatory review session with Ms. Ashley. Finally, students were able to take the South Carolina Certified Nursing Assistant Exam. The exam, given at Westwood High School, included a written test with 70 multiple choice questions and a skills exam where students had to accurately perform five skills in 30 minutes. Mid-Carolina AHEC is proud to report that all students passed the exam! In the future, Mid-Carolina AHEC anticipates offering more CNA courses to students who meet certain requirements. Mid-Carolina AHEC would like to extend a heartfelt thank you to Ms. Ashley and Ms. Burgess for their willingness to teach the CNA class and provide students access to clinical experiences. For more information, please contact Mid-Carolina AHEC HCP Coordinator Erica Davis at ericadavis@comporium.net. Reproduced here from Spartanburg Regional Healthcare System's Newsroom website. Please visit their website for more information and news about Spartanburg Regional Healthcare System. Only 12 of 3,500 applicants are recognized with the 2015 Excellence in Graduate Medical Education Award by the American Academy of Family Physicians (AAFP). Spartanburg Medical Center family medicine resident Brintha Vasagar, MD, MPH, was one of those 12 and the only resident in the southeast to receive this award. The AAFP’s Excellence in Graduate Medical Education Award recognizes outstanding family medicine residents for their leadership, civic involvement, exemplary patient care, and aptitude for and interest in family medicine. Dr. Vasagar, a family physician from Hatfield, PA, will receive the award at the American Academy of Family Physicians annual meeting in Denver, CO. The AAFP Family Medicine Experience (formerly AAFP Assembly), one of the largest gatherings of primary care providers in the country, will be held Sept. 29 through Oct. 3, 2015. Dr. Vasagar is a third year family medicine resident at Spartanburg Medical Center (SMC), part of Spartanburg Regional Healthcare System. Along with caring for patients, Dr. Vasagar serves as a liaison between faculty and residents as chief resident of SMC’s Family Medicine Residency Program. Dr. Vasagar is a graduate of Georgetown University, American University of Antigua and Johns Hopkins University. She also spent a year completing a post-doctoral fellowship in clinical research at the Center for Celiac Research at Harvard. Dr. Vasagar was drawn to Spartanburg Medical Center not only because of the professionalism of the program, but also the friendliness of the area. Dr. Vasagar has written for numerous publications, made scientific presentations, and on-camera appearances regarding public health and medicine. In the future she hopes to become Surgeon General of the United States and revolutionize the way we view health. A survivor of the 2004 tsunami which devastated South Asia, she has spoken before members of Congress and the United Nations about international health issues and disaster preparedness. The SMC Family Residency Program is one of the largest of the family medicine programs in South Carolina. SMC has 12 family medicine residents per year, with six transitional interns assisting in first year call to assure a manageable call schedule. To maintain membership in the American Academy of Family Physicians, physicians are required to complete a minimum of 150 hours of accredited continuing medical education every three years. The AAFP was the first national medical specialty organization to set continuing education requirements for its members. This requirement helps ensure family physician members stay current on the most up-to-date medical technologies, research and techniques. Spartanburg Regional Healthcare System (SRHS) offers a full spectrum of services through four hospitals: Spartanburg Medical Center, Pelham Medical Center, Spartanburg Hospital for Restorative Care and Union Medical Center. SRHS also includes Ellen Sagar Nursing Center, 113-bed long-term care, skilled nursing facility that offers nursing care and rehabilitation services. SRHS provides unparalleled oncological care through the Gibbs Cancer Center & Research Institute. The multidisciplinary Medical Group of the Carolinas has more than 300 physicians across seven counties in two states. SRHS employs nearly 6,000 associates and offers outpatient surgery centers, a vibrant post-acute division, a Level I Trauma Center, and Advicare, a licensed Health Maintenance Organization (HMO). Advicare provides Medicaid services to residents throughout the state of South Carolina. U.S. News and World Report ranked Spartanburg Medical Center the No. 1 regional hospital in South Carolina in 2014-15. The Commission on Cancer gave Gibbs Cancer Center & Research Institute its Outstanding Achievement Award. Approximately one in four of all office visits are made to family physicians. That is nearly 214 million office visits each year — nearly 74 million more than the next largest medical specialty. Today, family physicians provide more care for America’s underserved and rural populations than any other medical specialty. Family medicine’s cornerstone is an ongoing, personal patient-physician relationship focused on integrated care. To learn more about the specialty of family medicine, the AAFP's positions on issues and clinical care, and for downloadable multi-media highlighting family medicine, visit www.aafp.org/media. For information about health care, health conditions and wellness, please visit the AAFP’s award-winning consumer website, www.FamilyDoctor.org. 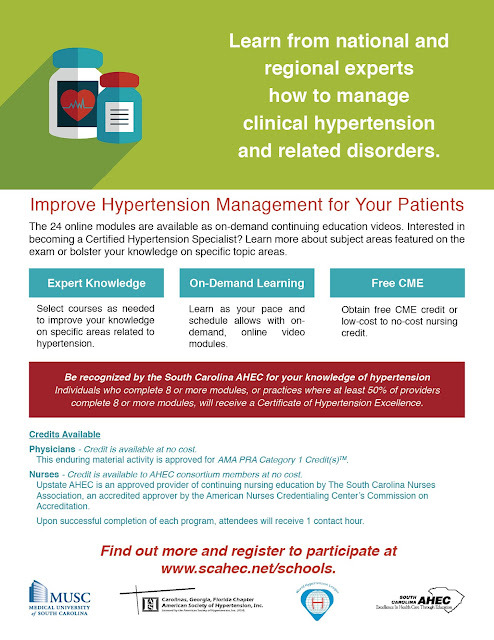 Learn from national and regional experts how to manage clinical hypertension and related disorders through 24 online video modules. To find out more and register, please visit the SCHOOLS website. 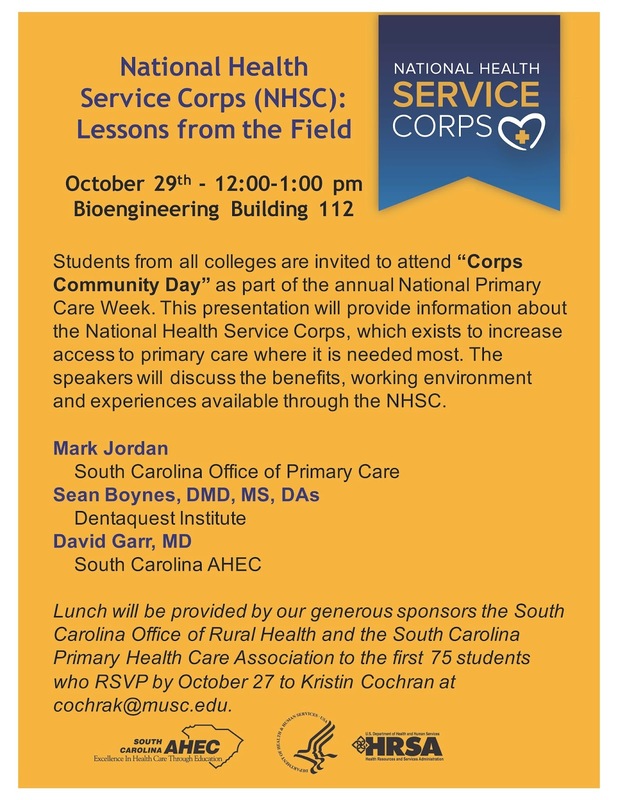 Health professions students from across the state are invited to take advantage of South Carolina’s recognition of “Corps Community Day” as part of the annual National Primary Care Month on October 29 at noon. This program will provide information about the National Health Service Corps (NHSC), which exists to increase access to primary care where it is needed most. The NHSC is a federal program that provides scholarships or repays the educational loans of health care providers who agree to serve a minimum of two years in a federally designated health professional shortage area. Mark Jordan, Director of the South Carolina Office of Primary Care, will provide an overview of the NHSC including scholarship and loan repayment opportunities. Sean Boynes, DMD, and David Garr, MD, will discuss the benefits, gratification, working environment, and experiences available through the NHSC. 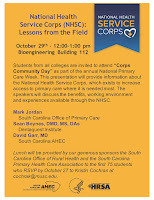 The event will also include brief videos featuring NHSC loan repayment recipients. The program is sponsored by the South Carolina Area Health Education Consortium (AHEC), the South Carolina Office of Rural Health, and the South Carolina Primary Health Care Association. The event will take place at MUSC in Room 112 of the Bioengineering Building, and lunch will be provided to registered attendees. Students from other health professions programs in the state are invited to connect to this program using videoconferencing technology. To register, please contact Kristin Cochran at 843-792-6977 or cochrak@musc.edu. This past summer, Mid-Carolina AHEC partnered with Midlands Technical College (MTC) to offer Adventures in Nursing: Discover How It Starts to Mid-Carolina AHEC Health Careers Academy students. MTC Nursing Instructor Shirley Bannister, MSN, RN, CWCN, provided opportunities for students to rotate between sessions on blood pressure and wound care and the simulation lab. The students learned to take blood pressure using a simulation mannequin known as SimMan 3G in the MTC Simulation Center. Each student was taught how to apply the blood pressure cuff, listen for the Korotkoff sounds using a stethoscope and obtain the systolic and diastolic blood pressure. The students attended a mini-lecture on the four stages of pressure wounds. Then they were given the opportunity to stage and dress pressure wounds in the lab. The students demonstrated how to remove soiled gloves that were contaminated with various germs. Mid-Carolina AHEC would like to extend a huge thank you to Midlands Technical College Department of Nursing and Shirley Bannister for providing this opportunity to the Health Careers Academy students. To find out more about the Mid-Carolina Health Careers Academy, contact Mid-Carolina AHEC HCP Coordinator Erica Davis at ericadavis@comporium.net. This year, the MUSC College of Health Professions Department of Healthcare Leadership & Management has teamed up with Carolinas Society for Healthcare Strategy & Market Development (CSHSMD) to co-present a two-day conference on October 22-23 in Charleston. This conference is designed to offer healthcare administrators, executives, clinicians, information technologist, leaders, faculty and students in the healthcare industry an opportunity to exchange ideas. Visit the website to find out more and register.